An artist that continues to challenge herself, Christina Dy has been creating large-scale charcoal works that push the boundaries of the medium. Her drawings, are both large and intimate, reminiscent of seeing someone up close for the first time. Her first solo show in Silverlens Gallery, Curtains Matching Carpet, was part of the exclusive shortlist of artists for the 2008 Ateneo Art Awards. In 2009, Dy was named one of the Cultural Center of the Philippines’ 13 Artists Awardees. 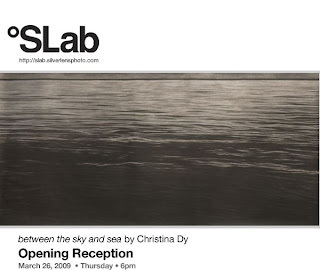 between the sea and the sky by Christina Dy runs from March 26 to May 2, 2009 at SLab (Silverlens Lab). Dy will be giving an artist talk on April 18, Saturday, from 3-5pm between the sea and the sky will be shown along with Neal Oshima at Silverlens and Mac Valdezco at 20Square.